Pool Chemicals & Testing. Spa Chemicals & Sanitizers. Sign up to receive special insider notifications of deals, promotions, and new items! 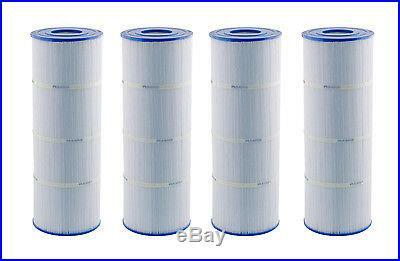 4 Pack Pleatco PCC80 Filter Cartridge Pentair Clean & Clear 320 R173573 C-7470. 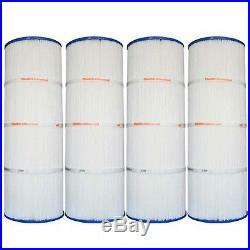 Replaces the following Cartridge Filters. Filter Dimension & Specs. Area: 320 Total Square Feet. Pleatco filter cartridges center around a completely unique, uniformly bonded filtration media driving super-charged cleaning performance, vastly superior to anything that has come before. Their 4oz bonded media contains more fibers per unit area offering far greater volume dirt holding capacity than other filtration fabrics. The Free Flow Core Technology consistently delivers lower pressure and higher flow rates resulting in a regulated gentle flow that uses less energy, creates less wear and tear on the pump and ensures a longer life of the product. Advanced Filtration Fabric – 4oz media with the highest fiber count, holds more dirt. Free Flow Core Technology – Better flow rates, increasing filter life. Longer Service Life – Clean less frequently and lasts longer. Antimicrobial End Caps – Inhibits growth of bacteria for the life of the product. Super-Bond Bands – Break resistant keeping the pleats crips, clearly defined and evenly seperated. Questions about this item? To make sure we get the order to you as fast as possible, orders are processed as soon as they come in. We cannot guarantee that any order can be cancelled once placed and processed. Included in this but not limited to are Heat Pumps, Gas Heaters, Large Filters, Slides, and Diving Boards. These products are delivered to the front of the driveway, not to the garage or installation site. The trucking company is not responsible to transport your items anywhere other than the front of your driveway. In this circumstance, we will call you with the additional charges. To help make this process as smooth as possible please follow these guidelines. Sign Bill of Lading (receiving bill). This document says that the order has been received. This all states that the order has arrived in good condition. It is the customer’s responsibility to inspect all packages received. This document also states the number of cartons you are receiving, please make sure this number is the same as the actual number of cartons received. It is your responsibility to make sure your order is in good condition upon receipt. Return must be in brand new condition. Here at Backyard Pool Superstore, we understand that mistakes can be made. All warranties are held with the manufacturers of the product. Backyard Pool Superstore will take care of this issue promptly and without any extra charge to you the customer. If you accept the product off of the truck, you now own the product. Please inspect all packages thoroughly before acceptance. Our staff is dedicated to making sure your experience with us is not only good, but the best! We are not just “Internet retailers”, we are pool and backyard professionals that have been in business for over 20 years. We pride ourselves on fast, professional customer service. We use the latest technology to assist you with your pool, spa, patio, and backyard needs. The Best Customer Service and Expert Advice. With many years of experience in all aspects of the pool and backyard industry, we are here to help you with all of your questions. If one of our staff members cannot help you immediately, we will not rest until we find an answer to your question. 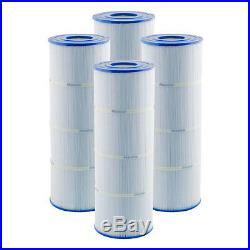 The item “4 Pack Pleatco PCC80 Filter Cartridge Pentair Clean & Clear 320 R173573 C-7470″ is in sale since Tuesday, January 19, 2016. This item is in the category “Home & Garden\Yard, Garden & Outdoor Living\Pools & Spas\Pool Equipment & Parts\Pool Filters”. The seller is “backyardpoolsuperstore” and is located in Multiple Locations. This item can be shipped to United States. Clean & clear 320 cartridge replacement. This pleatco replacement cartridge is for. Clean & clear 320 & clean & clear plus 320. All cartridges will be 100% genuine reemay and exact size. Please look at the cross-reference above for more details about the cartridge. All cartridges use genuine reemay spunbound polyester media. End caps for the pool and spa cartridges are made from a durable polyurethane material and are available in a variety of configurations. If an item arrives damaged, please refuse the item so that it may automatically be returned to us. Of the desired item(s) to you. Please include a copy of the invoice with a written. Explanation of the reason for returning. If your product has a rebate listed, we will provide you with all information you may need to complete the rebate request. The item “PLEATCO CARTRIDGE FOR PENTAIR CLEAN CLEAR PLUS 320 C7470 C-7470 R173573 SET OF 4″ is in sale since Friday, September 30, 2011. This item is in the category “Home & Garden\Yard, Garden & Outdoor Living\Pools & Spas\Pool Parts & Maintenance\Pool Filters”. The seller is “a1_superdeals” and is located in Las Vegas, Nevada. This item can only be shipped to United States.